On October 11, invited by “Master Ge Hong Colloquium” of Wuhan Institute of Virology, Walter Ian Lipkin, a professor at the Center for Infection and Immunity in Mailman School of Public Health of Columbia University, paid a visit to WIV for communication. He had given an excellent report on “Small game hunting”, which was presided by Professor Zhengli Shi, to the teachers and students in our institute. In the report, Professor Lipkin analyzed reasons why emerging infectious diseases occur. He specially cautioned that climate change, transformation of means of human activity and other factors pose a great threat to public health. Therefore, pathogen surveillance and research on pathogen discovery among wild animals, livestock, poultry and humans, and develop those rapid and effective measures on pathogen diagnose and detection are supposed to be in dire need. 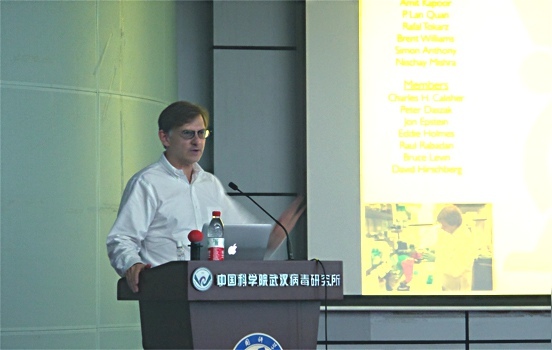 Then, he made a simple introduction to the development and evolution of techniques and tactics on pathogen discovery, and demonstrated the current progress of molecular biotechnologies, like virome capture sequencing platform for vertebrate viruses, and their applications in pathogen discovery. After that, Professor Lipkin shared his teams’ experience with us, such as surveys on host animal of MERS coronavirus in Saudi Arabia, discovery of hepacivirus in bats and surveys on pathogens in Rattus norvegicus which relate to human diseases in New York.